Inbound marketing is a strategy that utilizes many forms of pull marketing – content marketing, blogs, events, SEO, social media and much more – to create brand awareness and attract new business. In contrast to outbound marketing, where marketers attempt to find customers, inbound marketing earns the attention of customers and makes the company easy to be found. When dealing with lead generation and inbound marketing, you need to ensure that all visitors convert their visit into an action and that most of them are qualified. Bringing leads at all costs through gimmicks will negatively affect your productivity. An effective inbound marketing strategy connects businesses with sales prospects by naturally drawing them to your content. 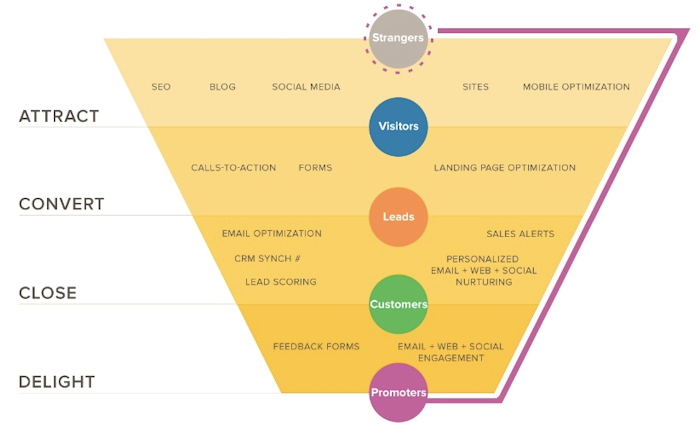 A top lead generation agency understands the right inbound marketing tools must be used to maximize the effectiveness of your sales funnel. Combining a strong platform with powerful integrated applications dramatically improves the reach and efficiency of your initiatives. Inbound marketing platforms fill many gaps, from increasing organic traffic and streamlining publishing of information on multiple channels that offers strong analytics to proposing the right content elements to be developed. One of the most popular platforms used by inbound marketing agencies and their clients, HubSpot provides the perfect environment for a strong collaboration client - agency. HubSpot acts as the central publishing, monitoring and reporting hub between the entire marketing team - internal and external. Using the platform and following the methodology significantly increases the overall website traffic by an average of 2.4x and the number of leads by 5.9x in the first year. Among Houston marketing agencies and as a HubSpot Gold Agency Partner, HexaGroup executes inbound marketing services to the highest standards. Our consultants are HubSpot certified and have experience developing B2B and B2C content marketing campaigns for small and large businesses alike.